I ran my last run of the year this evening, down by the sea, as early fireworks exploded on the other side of the bay over Newhaven. I also have two other expeditions to record, Boxing Day's, a run up Seaford Head and round the Cuckmere, and Tuesday's, by way of contrast a flat trip the length of the bay, to Newhaven East pier and back. In 2008 I ran two marathons, three half marathons, a ten mile, a 20K, a ten mile and two 10ks. Apart from the 20k, a new distance for me, I failed to record personal bests in any of these, but still, I am getting older. I also joined the Seaford Striders. In 2009 I have a place in the London marathon, and I've just submitted my entry to the Sussex Beacon Half Marathon. There will be other races, doubtless. The memorable points from yesterday's run, after a week's rest to recover from the Mince Pie Ten mile, were the view of the bay from the top of Seaford Head. with the orange sails of four Squibs from Newhaven & Seaford Sailing Club enjoying their Sunday morning sail and some fishermen on the beach, arrayed in a row, each in a small shelter like a hermit in his cell. I took the Chyngton/north face of Seaford Head route. A couple of weeks ago there was a wonderful TV programme on Einstein and Eddington. Einstein is one of the most famous men of the Twentieth Century, and his image is an icon, but of Eddington I knew nothing. I had no idea that it was his observations, confirming the deflection of light, which caused worldwide headlines about the proof of relativity and made Einstein a celebrity. More to the point I knew nothing about the strength of character that allowed him to pursue a scientific truth in the face of wartime hostility to anything German. He was certainly a great man whose life should be celebrated. The Eddington Number in this context is defined as E, the number of days a cyclist has cycled more than E miles. For example an Eddington Number of 70 would imply that a cyclist has cycled more than 70 miles in a day on 70 occasions. Achieving a high Eddington number is difficult since moving from, say, 70 to 75 will probably require more than five new long distance rides since any rides between 70 and 74 miles will no longer be included in the reckoning. The construct of the Eddington Number for cycling is identical to the h-index that quantifies both the actual scientific productivity and the apparent scientific impact of a scientist. This can be applied to running. (As I can’t be bothered to get out my old diaries I will only look at the annual number). This year I have run more than 6.5 miles 24 times but my E number is 10. Taken by Louise Whittles. to whom I'm grateful for the scanned version, in the summer of 1986 ; I think I had just been for a run round Clissold Park. Note the dark, fluffy hair and the Murdoch is bad news t-shirt, obligatory under the runners' dress code of the time. The t-shirt is as relevant today as it was then. It was gorgeous weather for my fourth attempt at the Mince Pie Ten Mile, sunny with hardly any wind. The course record fell to Andrew Donno of Brighton and Hove who finished in 59:03 and the first woman home was Emma Richards of Lewss AC in 1:14: 04. I was a little way behind,, finishing in 1:35:39, 142nd out of 188 finishers. I was over dressed: I wore a fleece top over a t-shirt, but would have been fine in t-shirt alone. I had the pleasure of meeting SamIAm and FatBuddha, of Runners World forum fame. 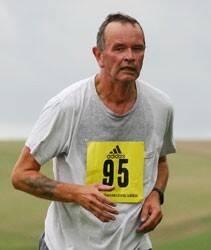 This was the last race of 2008; the first in 2009 will be either the Brighton Beacon or Eastbourne half-marathons. Because I had a little time to spare, and because I had chic new running headgear to try , I did a short twenty minutes last night, down to the sea and back. It's hard to know how far to run the week before a race. It's a week till the Mince Pie Ten Mile, so about two-thirds of the distance seemed about right, though I went out with no clear idea of how far I was going to go; it seemed important to include some hills, as the Mince Pie Ten Mile has a fierce one at the six mile point. I ran up Seaford Head by way of the golf course, then along the top of the cliffs, down to Splash Point and along the front to the sailing club and back. It wasn't particularly cold, so I wore a top, but no gloves.